Short Bags - Night Flyers Short Bag - Tarot Bags, Tarot Cards, Cloths, & More! When the sun goes down, the night fliers come out. This orange fabric is covered with owls, bats, and perhaps even a vampire or two. Store your most mysterious treasure within it. 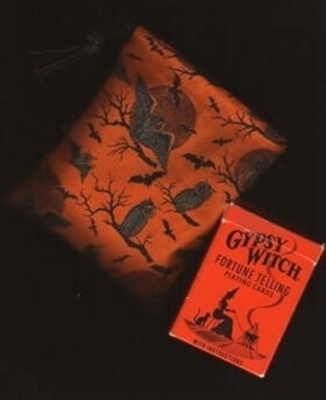 The bag is shown here with the Gypsy Witch Fortune Telling Playing Cards. Size: Short, approx. 5 x 6 inches. Fits runes set or mini or pocket tarot decks. Cord is black.